Free SSL certificates for Nginx HTTP/2 based SSL are coming to Centmin Mod LEMP web stack thanks to Let's Encrypt free and automated domain validated SSL certificate offerings. Centmin Mod also has plans for automatic deployment of commercially paid SSL certificate on Nginx. 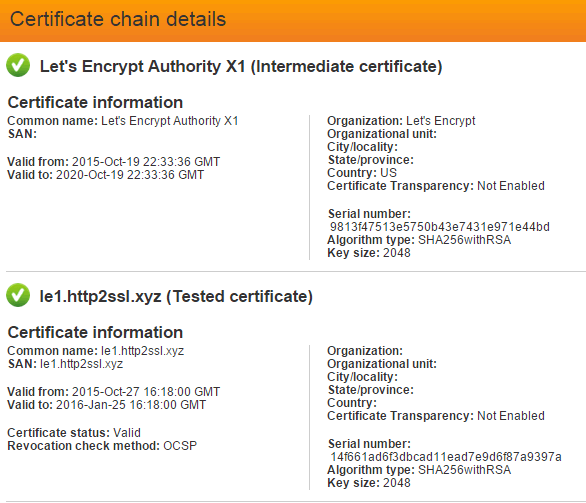 But for now Let's Encrypt free domain validated SSL certificates will be the first integration scheduled. With Let's Encrypt automation, you will no longer need to do the manual steps required to setup Nginx HTTP/2 based SSL (https) web sites outlined here and here. Let's Encrypt SSL certificate statistics are publicly available at https://letsencrypt.org/stats/ and status page at https://letsencrypt.status.io/. Let's Encrypt client integration work into Centmin Mod's Nginx web server is still in beta testing phase on both CentOS 6.x and CentOS 7.x. May 28th, 2016: total rewrite of Letsencrypt integration code and new acmetool.sh addon for automatically installing Letsencrypt SSL certificates on Centmin Mod Nginx vhost sites. More detailed step by step info available here. The latest example of Let's Encrypt webroot authentication plugin method for obtaining free domain validated SSL certificates. The Wordpress + WP Plugin auto installer integration with Letsencrypt via centmin.sh menu option 22 here. 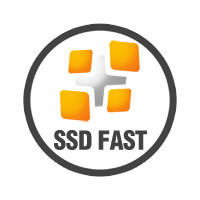 Letsencrypt Open Public Beta integration testing of manual renewal process here. Integration also includes auto renewal of Lets' Encrypt SSL certificates every 2 months (once SSL certificate expiry falls below 30 days (90 - 30 = 60 days). There's a minimum amount of free memory available required by the letsencrypt client installation routine initially as mentioned here. You'd want to be on a 1GB memory based system at minimal. 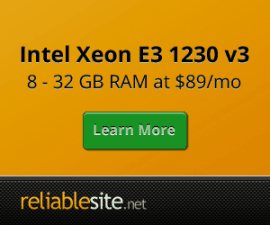 standalone - Very stable. Uses port 80 (force by --standalone-supported-challenges http-01) or 443 (force by --standalone-supported-challenges tls-sni-01). apache - Alpha. Automates Apache installation, works fairly well but on Debian-based distributions only for now. webroot - Works with already running webserver, by writing necessary files to the disk (--webroot-path should be pointed to your public_html). Currently, when multiple domains are specified (-d), they must all use the same web root path you will need to now pass multiple -w webrootpaths for each domain. manual - Hidden from standard UI, use with -a manual. Requires to copy and paste commands into a new terminal session. Allows to run client on machine different than target webserver, e.g. your laptop. nginx - Very experimental. Not included in letsencrypt-auto. Unfortunately, alot of Let's Encrypt client development was only on Ubuntu/Debian so support for other Linux distribution's Nginx and Apache web server implementation are not currently fully supported. However, recently a new plugin for webroot authentication plugin was created and can solve this problem by separating the steps for the automation of the web server configuration from the domain validation and issuance of the SSL certificate. Centmin Mod's integration of Let's Encrypt and auto generation of Nginx https SSL vhost using Let's Encrypt free SSL certificates will be done via the webroot authentication plugin. 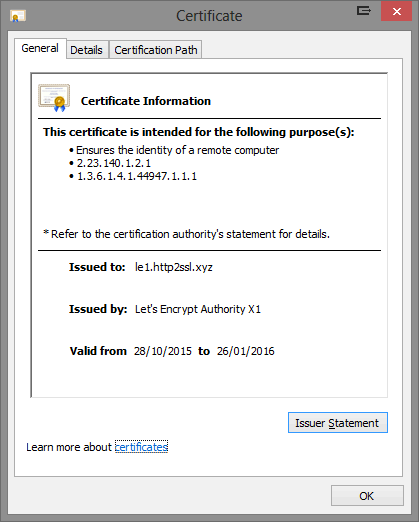 What is Letsencrypt Webroot Authentication ? Authenticator plugin that performs http-01 challenge by saving necessary .well-known uri validation resources (encoded token) to appropriate paths on the file system. It expects that there is some other HTTP server configured to serve all files under specified web root. run letsencrypt webroot authentication plugin method and pass your email address AND that site's public web root path to the command you run. This will perform the domain validation step. Automatically running the http-01 challenge / well-known uri creation on the defined web root validating the domain you want the SSL certificate for. A step similar to how folks validate domains added to Google Webmaster Tools or Bing Webmaster Tools. Letsencrypt client help info for webroot authentication method. The official Letsencrypt Webroot documentation will have the latest information for manually running the client. However, you will generally not need to do this with Centmin Mod's Letsencrypt integration as it's automated via Nginx vhost generator routines as shown below. The latest example of Let's Encrypt webroot authentication plugin method for obtaining free domain validated SSL certificates is outlined on the community forums here for auto creation of the Nginx vhost for beta invited whitelisted domain le10.http2ssl.xyz. Prompt for creation of nginx vhost le10.http2ssl.xyz. 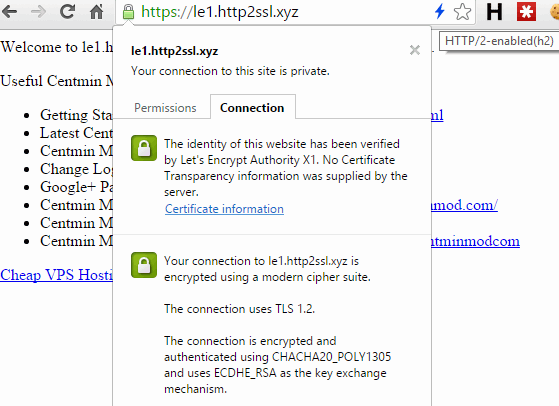 Selecting yes to self-signed SSL certificate and then Letsencrypt SSL certificate. There's checks for valid DNS for domain and if first time running also MX DNS checks for valid email address to register a Letsencrypt account (one time only task). domain vhost name's DNS A record to this server's IP addresss. otherwise, Letsencrypt domain name validation will fail. Installing Letsencrypt client via git clone. Right now each run of centmin.sh menu option 2 will also update letsencrypt client to ensure during the beta and public beta that latest client code is used always. Actual Letsencrypt webroot command is below where --user-agent centminmod-centos6-webroot is dynamically determined based on CentOS version. Here's a illustrative example of how the auto generated cronjob file works for auto renewal of Letsencrypt SSL certificate. This example is for le11.http2ssl.xyz domain and it's auto generated cronjob file located at /usr/local/nginx/conf/ssl/le11.http2ssl.xyz/letsencrypt-le11.http2ssl.xyz-cron. This is a manual timed run of the cronjob to auto renew the SSL certificate. Take note of expirydate.sh script reported and changed expiry date for le11.http2ssl.xyz SSL certificate. TLS server extensions (std)  "renegotiation info" "EC point formats" "session ticket" "status request" "next protocol"
Screenshots for another test Nginx vhost domain, le1.http2ssl.xyz on Centmin Mod LEMP web stack. Only A not A+ due to disabling HSTS header by default for my test sites as I need to be able to test my sites on both http and https versions. 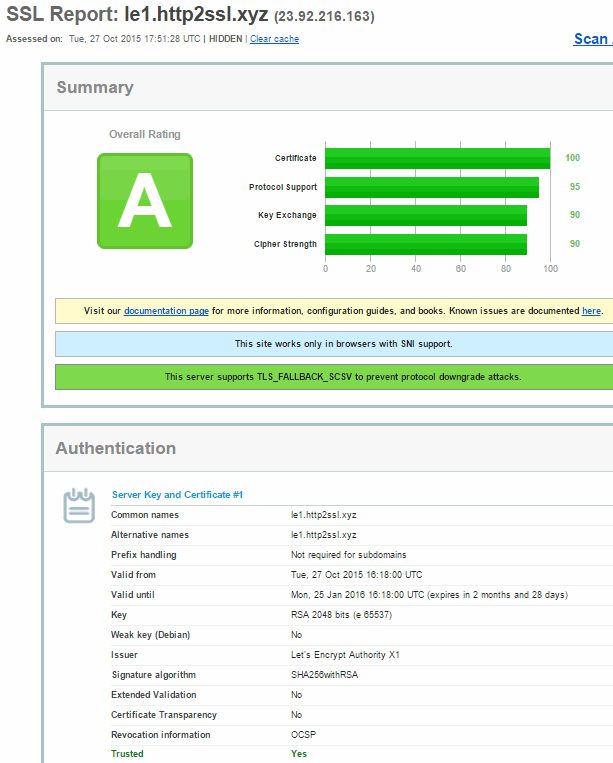 HSTS header allows A+ rating but prevents site testing on non-https version of site.